And all of those thing help make the lives of We the People better in the long run. Good, modern infrastructure, schools and teachers, universities, police, firefighters, parks, libraries, courts, scientific research, environmental protection, food inspectors, job-safety inspectors and all the rest of the things government does make our lives better – and boost our economy in the long term. Government spending does not “take money out of the economy.” In fact it puts money into the economy, creates jobs and lays the foundation for future prosperity. 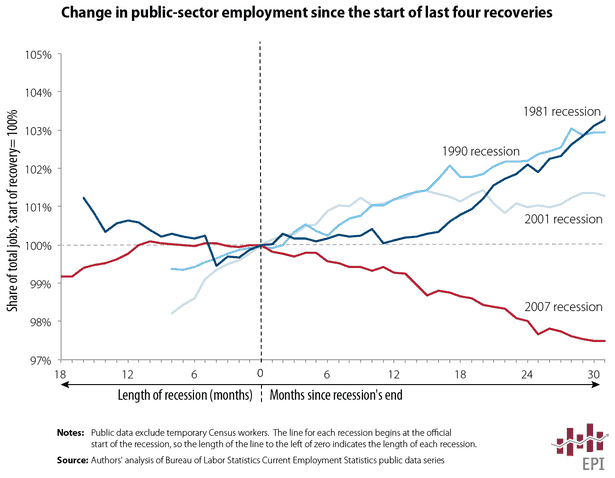 … this chart from The Atlantic, “The Incredible Shrinking U.S. Government,” shows how government spending to create government jobs helped us get out of the 1981, 1990 and 2001 recessions. But since the 2007 “Great Recession,” we instead have laid off hundreds of thousands of government employees, obviously making unemployment even worse. 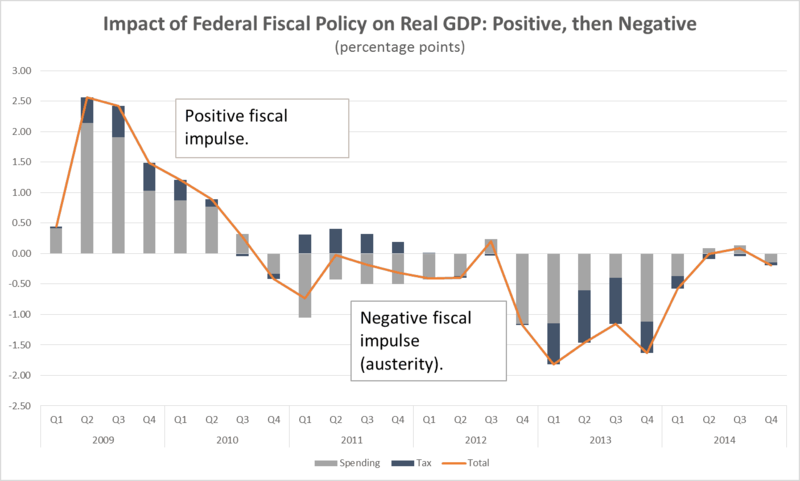 Government spending obviously helps boost a flagging economy. Cutting government spending during a slowdown obviously takes badly needed money out of the economy at the very times it needs the help. There are those who think that it is wrong for government (We the People) to be able to do things like this, and these decisions should be left to “the market.” They want “limited government” and demand that government get “out of the way” of “the market” – i.e. those with money – and let the big corporations and the billionaires behind them make the decisions, not We the People. Terms like “the market” and “free enterprise” is modern wording applied to the age-old fight between those who already have great wealth and power, and regular people who are powerless unless they are able to band together in democracy to protect each other from the power of the wealthy. The thing is, the “private sector” is the very sector that is in a downward spiral during slowdowns. Without an outside force – government – stepping in to boost demand there is nothing to interrupt the downward spiral. “Austerity” cutbacks in government literally take money out of the economy. Austerity cuts back on maintaining the infrastructure and teachers and police and firefighters and construction workers and scientific research – all at the very time that businesses are also laying people off. We have seen this in the United State because of budget cuts forced by Republicans – especially the “sequester” forced by the debt-ceiling standoff. But in Europe, the austerity has been much worse than here, and the result have been much more devastating to Europe’s economy and people. We can only hope that Europe’s leaders are starting to get it that taking money out of the economy takes money out of the economy. This entry was posted in Democracy and Community, Economics, Government and Governing by Dave Johnson. Bookmark the permalink. We know this, but I don’t think we can do anything about it. Think about it: We looked at the policies and programs that were implemented from FDR to Reagan, which took the US to its height of wealth and productivity, and chose to reverse course, doing the direct opposite. Democrats and the media marketed to liberals embraced the right-wing socioeconomic agenda, effectively pitting the middle class against the poor. Divide and conquer. Millions voted for Barack Obama in hopes that he could launch a legitimate public discussion about our poverty crisis. He tried a number of times. Lib media continue to focus on appealing to middle class consumers and campaign donors. Not everyone can work, and there aren’t jobs for all who need one. The US shipped out a huge chunk of our working class jobs since the 1980s, and Democrats ended welfare in the 1990s. The middle class has enthusiastically supported the austerity agenda as applied to the poor, and it’s their own fault for thinking it wouldn’t trickle-up to pull them down, too. What the rich are now doing to the middle class is what the middle class already did to the poor.